Have you ever started a project you were really excited about, but then failed to finish. And I bet there are authors, artists, and other creatives you admire, and secretly wish you had the lives of. You are failing your potential. 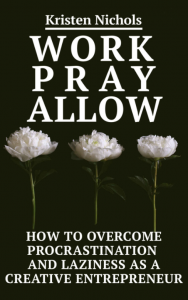 Work Pray Allow will take you through a self-awakening introduction, followed by a 21-day sprint as you accomplish one of your most procrastinated personal or professional goals. Author Kristen Nichols was more lost than ever after a seven year relationship ended in divorce. In the years that followed, she flopped aimlessly through life begging for some identity, some direction. After finally discovering the ancient technologies of Kundalini Yoga’s breath and meditation techniques, she learned how to draw out those answers she had been so desperately in search of. Today her life looks better than she could have ever imagined, and it is her mission to help others follow through on their dreams as she has been able to. I was tired of never finishing so many things I started. Unfinished books, products, brands, each made me feel full with excitement and life force as I began. But all would eventually be abandoned. I decided to start finishing things. This book is the road map to doing so. It is a pathway to potential. Today, in 2018, I have a life more full with love and miracles than I could have ever possibly imagined. Most vitally, I know who I am, and how to keep an anchor on that to ride me through all of life’s storms. At 38, I now understand that life is full of peaks and valleys. There is no true balance; normal can be squashed like a bug by any of life’s unexpected upheavals. Every time normalcy begins to set in, a new normal will become necessary, either because of life’s potholes or simply due to complacency. The trick to staying on a path that will lead you to your destiny, to the fulfillment of your most powerful dreams, is having a good toolbox and knowing how to keep a read on your own inner compass. In 2013 I left North Carolina at the age of 32, leaving behind everything I thought I had ever wanted. The business, partner, family, home, city, friends, the dreams I’d helped to build, the books I had helped to edit, the business whose growth I had excitedly cheered; none of it was mine—anymore. None of it ever really was, I suppose. I lost so much that I lost myself. Looking back now at that time in my life, I don’t think I had actually discovered who I really was in the first place.